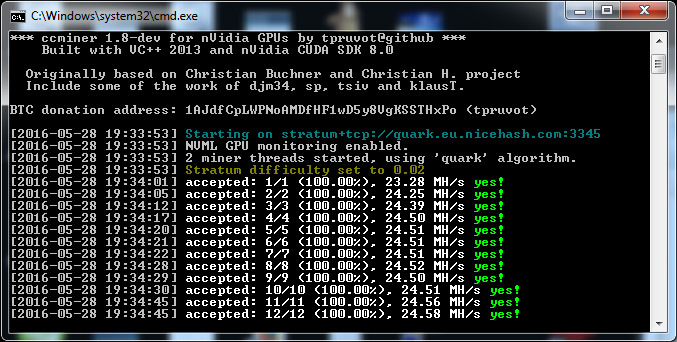 Here comes another interesting update of ccMiner from tpruvot with a new Windows binary of the latest ccMiner 1.8-dev (source) that comes with Compute 6 (SM 6.0) and CUDA 8.0 support in time for the availability of the new Nvidia GeForce GTX 1080 and 1070 GPUs. The release below includes two versions of ccMiner, one is 32-bit binary for Windows that is compiled with CUDA 8.0 and with support for Compute 2.0 or newer Nvidia GPUs, and another that is 64-bit Windows binary compiled with CUDA 8.0 for Compute 5.0 or newer Nvidia GPUs. In order to use the new ccMiner with CUDA 8.0 you will have to use video drivers 362 or newer that do come with support for CUDA 8.0, so if you have not updated yet you might want to do so now. We have not done any tests to see if the new CUDA 8.0 will bring better performance or not as we still don’t have access to the new Nvidia Pascal GPUs, but as soon manage to get our hands on the new hardware we are going to be doing some testing of GTX 1080 and 1070 with ccMiner.